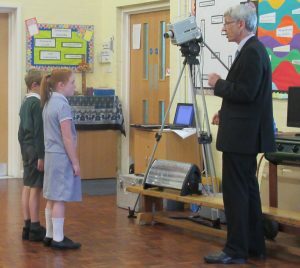 Megan Jessop (Kempsey Primary School) invited David Whitaker and John Gillham back to the school – this time to talk with the Key Stage 2 (KS2) students. 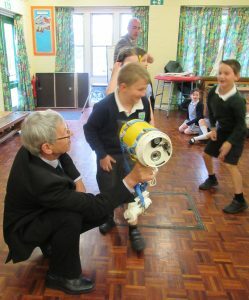 Pleasingly, many of the KS1 students remembered them and enthusiastically chatted with them again. With links into recent science and history lessons by both visitors, David explained how radar works – with a loud demonstration! – and the traumatic impact of many scientists and mathematicians arriving in Malvern to continue their secret war-changing research and development of radar. 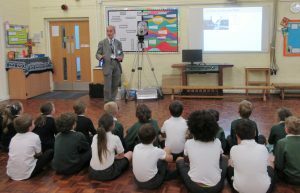 John engaged the students with technology to “see heat” with demonstrations and experiments involving infrared video cameras. 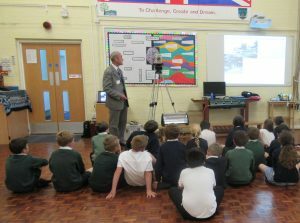 Each child saw themselves in hot and cold and looked through a firefighter’s camera. Megan reported that the children were once again “buzzing all day” with several now keen to pursue careers in STEM (Science, Technology, Engineering, Mathematics) subjects. David and John expressed their thanks for such a “warm” welcome from so many keen and well-behaved students. MRATHS is happy to support other schools from reception to 6th form (email: education@mraths.org.uk; offering to schools: https://mraths.org.uk/?page_id=2682).